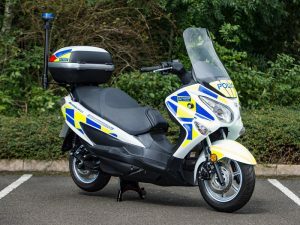 The zero-emission Suzuki Burgman scooters, which have a range of 75 miles (120km), will be trialled by police community support officers within the Roads and Transport Policing Command over the next 18 months and will be refuelled using a private refuelling station, provided by Fuel Cell Systems. The trial follows a decision by the Met in late 2015 to stop mandating diesel fuel for its fleet and will be run at no cost to the police force. The vehicle are being loaned by Suzuki Motor Corporation – which will use operational data from the trials for future development of its zero-emission vehicle development programme. The maintenance and fuel costs will be met by a collaborative project, which is being part funded by the Advanced Propulsion Centre (APC) and is being run by British fuel cell technology company Intelligent Energy, which helped develop the fuel cell for the Bergman scooter, in association with Suzuki GB and Cenex.